When I moved from 175/65/R14 to 185/65/R14, the ground clearance increased a bit along with ride and handling quality. Last edited by The Rationalist : 20th September 2015 at 19:39. I asked if seats are foldable. Answer was no. Then questioned on the purpose of emergency internal release from the boot. While many victims are kids playing hide-and-seek, many more are adults put in trunks in the course of a crime. No foldable rear seats, really? I do not understand why they cannot provide this useful feature. Many cars these days come with 60:40 split to increase utility. Could there be any reason why seats cannot be folded to increase boot space? I think, I Never saw 60:40 split seats in a sedan. It's usually available in hatchbacks. Hopefully, they make it available in Figo Hatch. Tushar and Aditya -Thanks a lot for this fantastic review. Attention to detail is brilliant and pin point. With stock tyres, the steering at slow speeds was light but, with just 10mm increase the steering feel has improved a lot and its now a whole lot tighter and its a slight effort to turn the steering now. Congratulations on your new ride.! The car looks superb in blue shade. Awaiting a detailed ownership ride. My T-Jet has 60:40 split rear seats. I remember GTO once mentioned that its one of the least used feature by the owners, but still feels good to have. No matter how much people are praising the car, after a short test drive of the petrol 1.2 at cauvery ford yesterday I felt that Ford had missed an opportunity here. The engine was lackluster and the interior panel somewhere near the steering console was already rattling and the quality was nothing to speak about. The diesel may be a gem of an engine but for people like me whom are looking at petrol options it really was a dissapointment. And after watching videos of the Ka plus I am feeling that Ford has just shorchanged us. Are you sure your Tjet has 60:40 seats; Can you post a picture? AFAIK all Linea's have had just foldable rear bench. I am sure Ford has got a winner on their hands. The segment demands a balanced looker with ample space. And with the 4 meter restriction, it is a real challenge for the designers. Fortunately, Ford has got it spot on. The diesel will be the star of the show, and it keeps my wondering who exactly would buy the 1.2L petrol, when the diesel is better in the city and on the highway and with a better fuel efficiency !! Also, the naked boot inside looks horrible. And more so in the competition. What sort of cost cutting is this. Thanks ! Thats a really nice and comprehensive review. A while back on WitWiky's thread, I mentioned that I was considering the Figo Aspire or the GT Twins. Was waiting for info on the build quality. Disappointed to see that they decided to cut costs in the sheet metal of all places. The trunk leaves so much to be desired. Really doubtful if it could take any hit at all. Would have been a great buy - fully loaded and that fantastic price. Time to move on. I accept constructive feedback. However, the last line of your post is out of line because we haven't promised the AT review anywhere. We would have liked to have published this review with the Aspire AT. But we've been told by Ford that the car hasn't been inducted into their press fleet yet. As Wildy, Vikrammohan, A4anurag & KreativeGeek mentioned, if the car hasn't been given to us for a drive, how can we publish a review of it? I could have gone to a dealer and test-driven the AT (like I have for some variants earlier). Although, a full detailed review of the transmission would require a long highway drive too, and not the usual 30 - 45 minutes at a dealership. No one would appreciate an AT review without details of how it performs on a highway, while overtaking etc. As an example, this review was possible only because I got to evaluate the car under different driving conditions. But hey, on the bright side, we will be driving the Figo hatchback with the DCT soon . If the Figo hatchback DCT wasn't happening, we'd have requested an owner to lend us his car for a day (as we've done earlier). Thanks! Had a Test drive of the Aspire Diesel after prolong follow-up from the Sales team at Wasan Ford. In fact I appreciate that they had the complete log of number of times they called me in the TD feedback form. Coming to the car, It had the same peppy feel of the Fords. Compared to Ikon the steering was a breeze to drive at parking speeds and not much weigh up as speed increases, but still good feedback. Finally, my question to them was what do they have to offer that my Ikon does not have other than the safety features. They just mumbled some usual jargons which was not impressive. Then they evaluated my Ikon Tdci 2009 model and gave a valuation of 75K . This for single handed, re-mapped Ikon with proper service records. They say it is discontinued and run more than 1 lac kms. I told them good bye. This gave me good insight as to how much margin the dealers have in USED cars !! 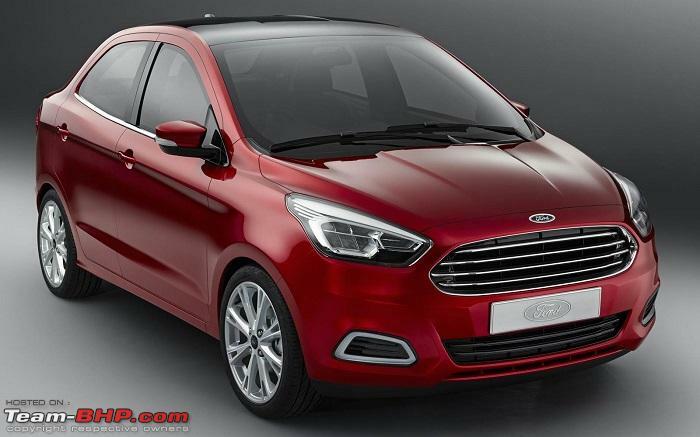 Hey, so that is conclusive proof that the Figo DCT is coming. Was wondering whether to 100 per cent believe the scoops indicating it was coming or not. There are many sedans out there with foldable rear bench, 60:40 split or not. My first question was, why would Ford want to bring out the car without a foldable rear seat (for that matter, in any other sedan, if rear seats cannot be folded, why is that so). Is there any technical, or any other logical reasoning for this here? Most compact sedan customers would have just migrated from a hatchback(where folding rear seats and increasing the boot space to carry a lot of stuff is possible), and they would find it weird, if they cannot increase the boot space by folding rear seats. Agreed that we won't be frequently needing this, but when we need it, previous hatchback owners might truly get surprised. Above points must be disappointing for all the Ford fans. Aspire looks good from some angles and ordinary from other angles, its my personal opinion. Rear is very bland and do not inspire at all. The portion above rear wheel is very bulky and looks odd. New Fiesta has same problem. Diesel looks promising but petrol is very disappointing for sure, all reviews confirms the same. Interior is okay but not great. The shade they have chosen is really bad and looks yellowish, pale. They should have gone with proper beige only or all black theme. Clearly all manufacturer's blindly following the leader, Maruti here, not a good thing at all. Not using their own brain at all. Top end diesel is feature loaded but touches 10 Lacs or more which is not good thing at all. Can't imagine paying that much for a CS model (cut sedan), my personal opinion. Any day I would go for Ciaz with that much money, which is proper big sedan, looks much better with loads of space.